Holiday Makeup With an Edge! Now that my MacBook Pro is working again, I was able to upload my previously recorded video! 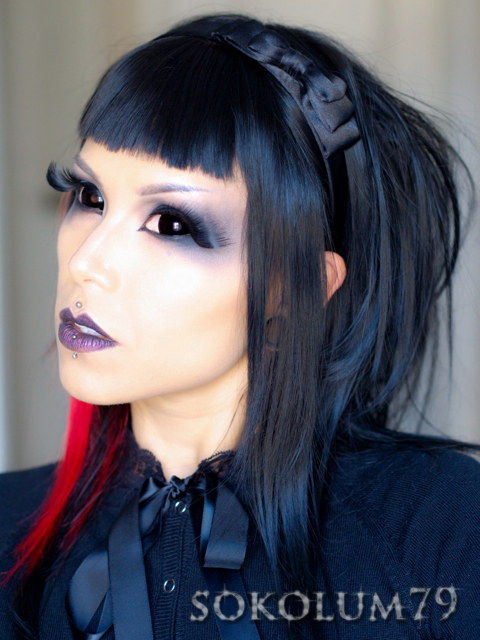 I felt like wearing a wig and my black sclera lenses today, so I made a dramatic FOTD to boot! I just created a very blown out black smoky eye, added a very dramatic pair of lashes from Sugarpill, gunmetal silver eyebrows, and used Annabelle gel liners on my lips for an iridescent purple effect. The wig is just a cosplay wig from eBay and I cut a fringe into it. I don't really have much to say about this look because it was just improvised as I went.